There are many metaphors for the sound of a glacier calving. A rifle going off, trains colliding, the crash and roll of thunder. None of these descriptions fully capture the sound, but they all suggest one thing: a sense of sudden, powerful violence. Fear and respect for earthquakes, landslides, flash floods, and other natural disasters is burned into our collective subconscious through thousands of years of experience. By contrast, it’s only recently that people have flocked en-masse to the calving faces of glaciers to admire them. The towers of fractured turquoise ice are undeniably beautiful. They are also sites of extraordinary power and chaos, and if you forget that, they are happy to remind you. On Wednesday, March 6, 2019, Cori Graves and I met up with a model and another photographer for a styled bridal shoot on Portage Lake. Temperatures had fallen enough in the last few weeks to form 6″ of glassy, crystal-clear ice on the lake, and hundreds of skaters had flocked from Anchorage to skate to the glacier. I had already been to Portage three times in the last week, and Cori had been twice. Conditions were borderline legendary. Today Cori and I skated, while our companions jumped on bikes with studded tires. I pulled a sled full of equipment and supplies for the shoot, and as we headed toward the glacier skaters on their way back craned their necks to watch us, probably puzzled by the big bouquet flying across the ice. En route to Portage Glacier. Screenshots from videos by Cori Graves. Two miles down the lake we rounded the corner and the glacier came into view, sparkling blue and white in the late afternoon sun. We stopped about a quarter mile (roughly 1,300 feet) from the calving face of the glacier, and Cori began unloading the sled. I left to scout out the other side of the glacier for the second part of the shoot. Glacial calving is one of those events in which nature slaps all of its cards on the table at once. You’ve chosen where you are, the glacier has chosen what it will do, and there’s nothing you can do to change it. “The waves are coming” the other skater said nonchalantly, motioning toward the face. Sure enough, we could see a row of low swells approaching, snapping the ice back into big plates. “Well,” he said, “I’m outta here.” He turned around and skated off, and that’s the last we saw of him. A few moments later the swells reached us. Lake ice rolling in the swells. Suddenly, the surface of the lake went from feeling as solid as a concrete floor to rolling like a trampoline. The refrozen plates snapped back apart, shooting water into the air and pushing small shards of broken lake ice to the surface. There wasn’t much to do except stand in place and wait it out. After less than a minute, the plates of lake ice stopped jostling and Portage valley returned so sunny, placid silence. If someone had rounded the corner to the glacier just then they would have had no idea what had happened, though they might have been curious about all the liquid water on the surface. Some of our gear was wet, but we all felt safe. I skated around to do some scouting, while Cori took a few more photos. Bridal shoot photos by Cori Graves, outlandcreative.us. After a while we packed the gear back into the sled and moved over toward the other side of the glacier, where the face mostly calves onto a beach rather than into deep water. The lake ice was sill fully intact on the other side of the face, and it was extraordinarily clear and smooth. Cori took a few more photos while I skated a few more small laps. As the light began slipping we packed up, and then headed for home. Heading back across Portage Lake. Screenshots from videos by Cori Graves. That night I watched the video a couple times and decided to post it to the NoricSkate-SouthCentral Alaska Facebook group, along with a few thoughts about safety at the glacier. Post on the NordicSkate-SouthCentral Alaska group. Click here for a link to the post on Facebook. As it turned out, there was more interest in the video than I’d expected. The post was shared over 1.2 thousand times on Facebook, and I started getting phone calls and messages from local news outlets. The Anchorage Daily News was first out of the gate with “Portage Lake ice rolls alarmingly after glacier calves.” Craig Medred wrote an article titled “All Cracked Up,” and then followed up with another piece critiquing ADN’s article. 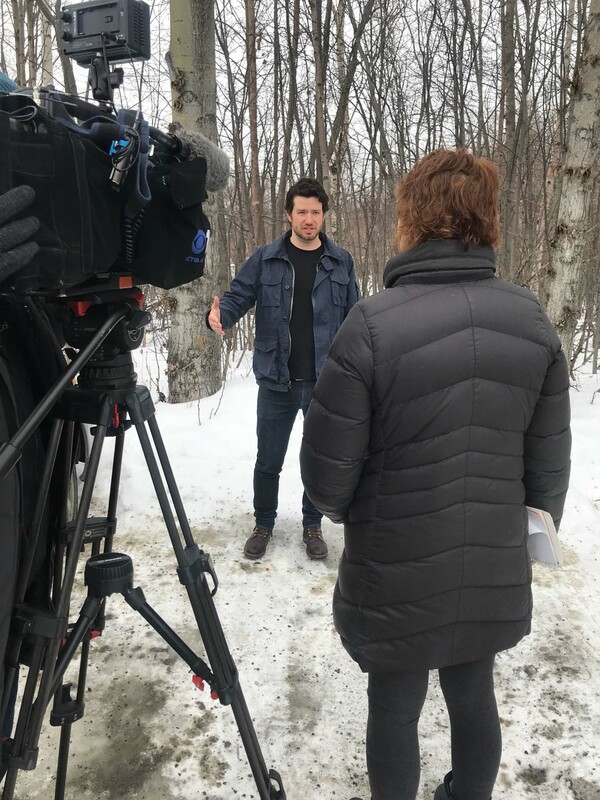 KTUU published an article, and I did on-camera interviews with KTUU and KTVA. Interviews with KTVA and KTUU. Photos courtesy Cori Graves and Cale Green. It was fun talking about glaciers and ice with the media, and by the end of the day it seemed that everyone in Anchroage had seen the video. More importantly, the video sparked an important (and arguably long-overdue) conversation about the way that Alaskans interact with our backyard glaciers. After looking at photos, videos, and satellite data, and after many conversations and messages on the phone and online, I believe that several important lessons can be drawn from this event. Some of these are specific to Portage Glacier, while others apply more broadly. Many glaciers, including Portage, calve during winter. This point might be the most obvious, but also the most important for general safety. Many people assume that glaciers stop moving in winter because their surfaces stop melting, or because the water that lubricates their bases (causing a process known as “basal sliding”) freezes. In fact, there are several forces that cause glaciers to move, including the sheer weight and pressure of the ice itself. Some glaciers contain so much mass that they can’t heat up or cool off quickly enough to respond to seasonal (let alone weekly) changes. Finally, any glacier that calves into a deep body of water will, by definition, be sitting in above-freezing liquid water year-round, and the water will be continuously acting on the submerged ice. There is ample evidence that Portage Glacier calves throughout the winter. Physical evidence includes ever-present icebergs and jumbled lake ice near the face, and cracked lake ice radiating outward from the calving face. There are also numerous videos and accounts online of calving events in winter and spring. Many people underestimate the likelihood or danger of a calving event. I had taken shots of the glacier face right before and right after the calving event, and by aligning the photos I was able to see the exact outline of the piece that came down. I then overlaid the outline onto photos taken by Cori Graves the weekend before, when hundreds of people were out on the ice. It is easy to imagine what could have happened if this event had occurred over the weekend rather than on a quiet weekday. Calving overlay photos. Photos by Cori Graves. The calving even that was witnessed was large, but not extraordinary or even really unusual. The fact that so many people casually put themselves in life-or-death danger at Portage suggests that our intuition and common sense are poor guides around glaciers. Even though we know on some level that glaciers move–and are moving–we seem inclined to treat them like stationary things. Our minds seem to struggle with the fact that glaciers feel as solid as rocks while also in motion. Social media has caused an explosion in traffic to Portage. It’s trendy to blame social media for everything (from “fomo” to lost presidential elections) but there’s no doubt that social media has increased traffic to Portage Glacier. Growing up in Anchorage, I occasionally heard rumors of “that one winter where you could skate all the way to the glacier.” Now, Facebook groups share near-instantaneous ice reports and Instagram is flooded with photos from Portage that, cumulatively, probably receive millions of annual views. Portage Glacier essentially has a grassroots marketing campaign that would make an ad agency jealous. Social media has the potential to introduce more people to the outdoors, but also carries significant risks. Social media draws large numbers of relatively inexperienced people to the glacier, and many people (perhaps unwittingly) take life-or-death risks in order to capture dramatic photos. These photos then become the only public reference point for safe and appropriate behavior at the face of the glacier. Below are screenshots of photos taken at Portage Glacier and posted to Instagram. All of these posts are public, though I have blurred the names and faces of the posters to protect their privacy. There’s no point in guilting individuals for a collective failure. However, I believe that sharing these photos is important because they demonstrate how social media encourages and then normalizes dangerous behavior at the calving face. Few people carry even basic safety equipment at Portage. Experienced backcountry ice skaters should always carry self-rescue ice picks and warm clothes in a dry bag, and should ideally have a throw rope and ice screw for rescuing others. Some experienced skaters even skate in life jackets or dry suits depending on conditions. In my experience, the relatively inexperienced user base at Portage is far less likely to carry even basic ice safety gear. This means that if an accident occurs, those affected are far less likely to have the tools or experience to execute a successful rescue. Experienced outdoorspeople are reluctant to share knowledge. The increased traffic to Portage and other glaciers has not yet been matched by an increase in knowledge about risk and safety. Recently I exchanged emails with a veteran outdoorsman who commented on the explosion of fatbikers and crust skiers on the glaciers without safety equipment or training in crevasse rescue. When I asked whether I could quote him for this writeup he declined, saying that he did not want to be a nag. This is understandable–after all, we watched over a hundred people walk right up to the calving face of the glacier over the weekend and hadn’t said anything. Nobody wants to be a scold. At the same time, experienced outdoorspeople are more or less the only source of safety information at Portage. Tactfully sharing advice here could save someone’s life. There are other risks at Portage. The mouth of the lake, adjacent to the Begich Boggs visitor center, often has thin ice and open water. There is significant avalanche potential on the steep slopes above either side of the lake. A large avalanche could displace far more water than a typical calving event. There is frequent rockfall into the lake, especially from the large cliffs on the northern side. Portage Valley is a microclimate between Prince William Sound and Cook Inlet, and often undergoes erratic wind, precipitation, and temperature swings. This chaotic weather can cause unpredictable ice thickness or hazards such as pressure ridges and ledes. A lot can be learned (or ignored) by reading the ice. Large refrozen cracks near the calving face suggest previous calving events that broke the ice–and the potential for similar events to do the same. Finely churned-up and refrozen ice chunks near the face of the glacier suggest that when it calves, the ice will completely shatter and put you in the water. Rocks on top of the ice indicate rockfall. This seems obvious, but as behavior at Portage demonstrates, warning signs are easy to overlook. Even more knowledge can be gained if the approximate age of the ice is known, and can even allow you to guess at the rate of rockfall onto the lake, the size of calving events, etc. The US Forest Service recommends that people stay off the ice in winter. This is reasonable. But Portage is an irresistable place, and people will continue to venture out on the ice as long as they’re able to do so. The calving event, media exposure and dialogue has taught me a lot about behavior at Portage Glacier. Everyone has a different tolerance for risk, and personally I am still comfortable venturing out on the lake. However, I would respect the avalanche forecast and also err on the side of caution regarding ice thickness. I would stay at least a quarter-mile from the face and even then, only if I’m mobile so that there is time to move away from a calving event. I would also urge knowledgeable members of the outdoor community to be more forthcoming about safety issues at glaciers, since it is really the only way that less experienced folks can learn without tragedy.